July 16, 2015 By This post may contain affiliate links. 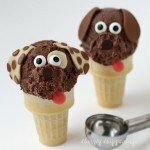 onto a cone to create these adorable puppies. Your kids will beg for more. This post is sponsored by Silk Cashew Milk. Well, if you are lactose intolerant summer can be devoid of the cold creamy dessert unless you find dairy free alternatives like cashew milk ice cream. 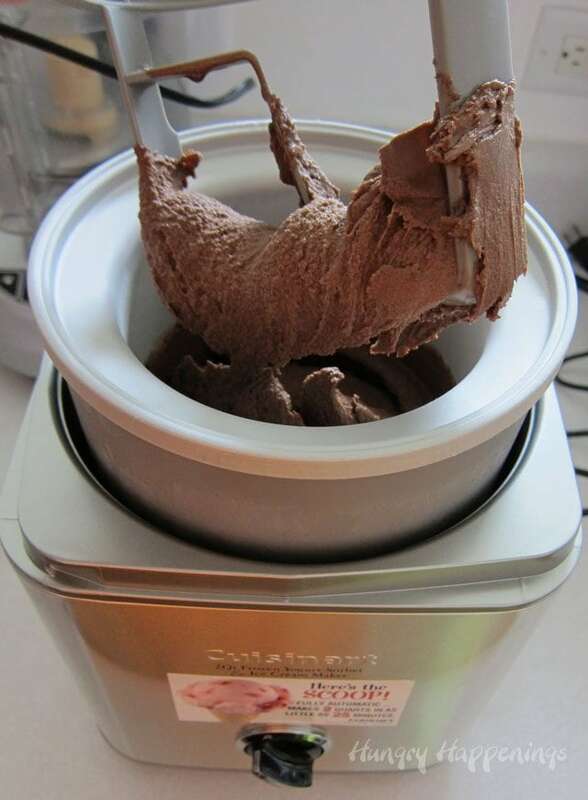 Now I’ve had dairy free ice cream before, but until I made a batch of this chocolate ice cream at home using Silk Chocolate Cashew Milk, I never knew just how amazing it can taste. This recipe made some of the most decadent ice cream I’ve ever eaten and it made the perfect scoops on which to make my sweet little puppies. Since discovering Silk’s cashew milk over the winter, I’ve used it several times to make chocolate ganache for truffles. The flavor and texture of those truffles made with cashew milk rivaled those made with heavy whipping cream, but had fewer calories. I’m all for saving calories, as long as I’m not sacrificing taste, so I love swapping cashew milk for cream. When I found out that Silk has added Vanilla and Chocolate Cashew Milk to their lineup, I was inspired to try my hand at making a dairy free ice cream at home. The milk is so thick and creamy that I just knew it would make a wonderful frozen dessert and I couldn’t resist trying the chocolate milk in my ice cream recipe. Chocolate wins out over vanilla for me most of the time. I’d definitely say I’m on team chocolate. How about you? Do you prefer vanilla or chocolate? To continue my series of ice cream cone treats, I thought it would be fun to make some sweet little puppies. 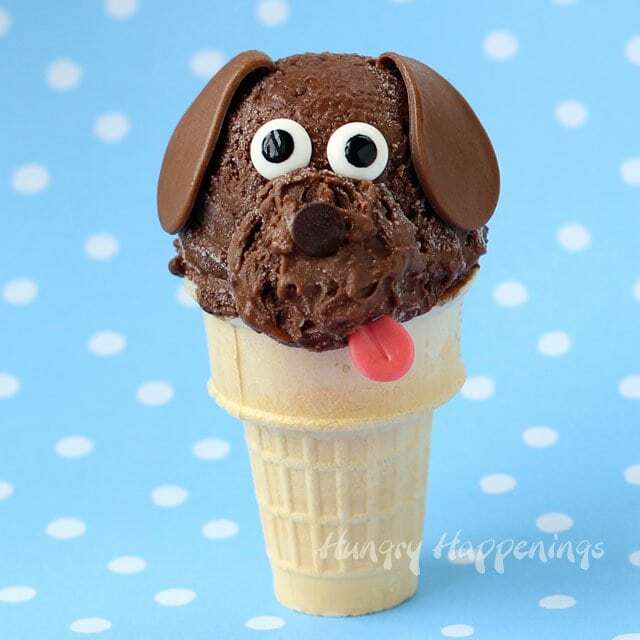 We’ve been spending lots of time at the dog park and I’ve got that itch to get a new puppy, but my husband isn’t ready for another dog running around our house, so I guess I’ll just have to settle for making one out of ice cream. 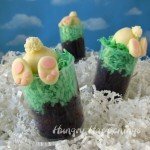 To make my puppy ice cream cones, I went the easy route and used some store bought candies that were not dairy free. If you are on a strictly dairy free diet, you can make modeling chocolate using dairy free chocolate. It’s a little more work, but it’s a great alternative. You can find the modeling chocolate recipe on my Chocolate Making Tips page. To make the ice cream you’ll make a basic custard recipe using egg yolks, sugar and cashew milk then freeze it. Start by whisking the egg yolks and sugar until they turn pale yellow. 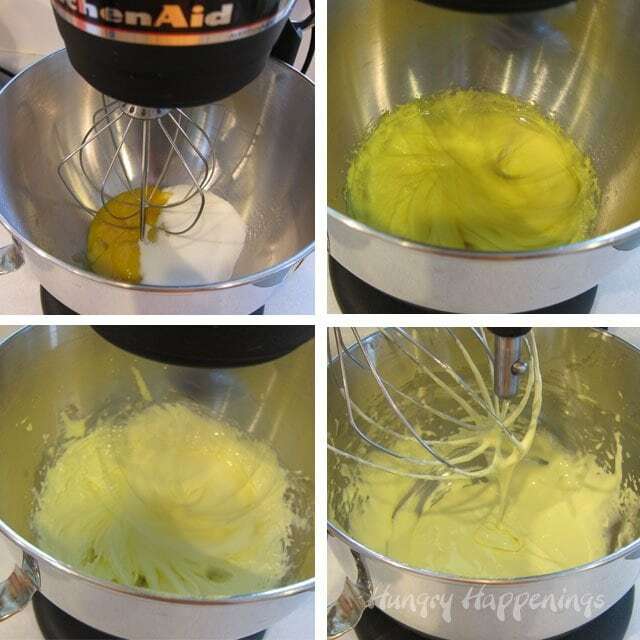 To test if they are ready, you want to lift the whisk and allow the eggs to fall back into the bowl in a ribbon that very slowly dissolves. Heat the cashew milk over medium heat just until bubbles form around the edge. To intensify the chocolate flavor, you can add some dairy free dark chocolate. If you want to save the calories, you can leave it out, but it really makes this a truly decadent frozen dessert. 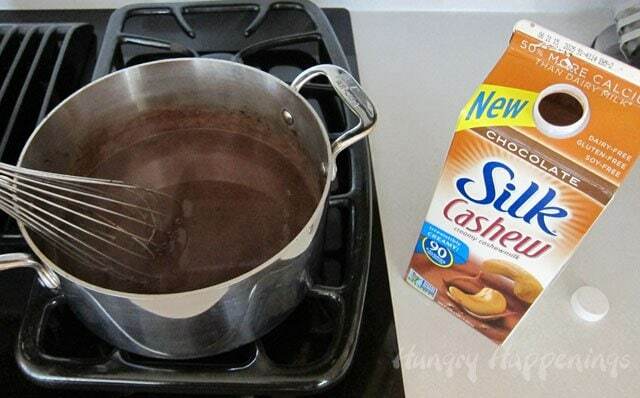 If using, add the finely chopped chocolate to the pan and stir until melted. Whisk about 1/4 cup of the hot chocolate milk into the eggs, then continue whisking while you slowly pour in the remaining milk. Pour everything back into the saucepan and set over medium heat. Constantly stir until thickened. There are two ways to check if the custard is ready. First, you can use a thermometer and heat until it reaches 180 – 185 degrees Fahrenheit. Second, you can coat a spoon or spatula with the custard, draw your finger through it (be careful it’s hot) and if it holds it’s shape then it’s ready. If not, keep stirring and try again. To ensure there are no cooked eggs in your custard, pour it through a fine mesh strainer. I was in hurry to make this ice cream, so I used a quick freeze method. I poured about 1/3rd of the custard into a shallow pan and popped it in the freezer for 30 minutes then placed the rest of the custard in the refrigerator. Then I combined the two and poured it into my ice cream maker and let it do it’s job. You can just refrigerate the custard for several hours or overnight, just be sure it’s really cold. After about 25 minutes, the ice cream will be ready to eat. If you want to make puppies though, you’ll need to wait a little longer. Scoop the ice cream into a freezer safe container and freeze until firm. This will take a few hours. 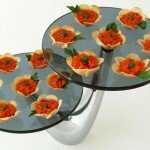 While you are waiting, you can get your decorations made. I mentioned before that I used candies that are not dairy free. 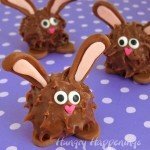 If needed, you can make your own modeling chocolate using dairy free chocolate. 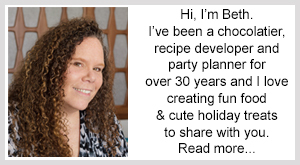 You can find the recipe on my Chocolate Making Tips page. To make the puppies ears, flatted out chocolate candy rolls or roll out some modeling chocolate. Use a 1 3/4 inch tear drop cutter or kitchen shears to cut out each ear. To make it really easy to attach them to the ice cream. you need to elongate the pointed end and curve it around something like a cutting board. That way you can just insert them into the top of the ice cream scoop. For the tongues roll out some red candy or modeling chocolate and cut 3/4 inch tear drops. Stretch out the pointed end and use a toothpick to add the line down the middle. 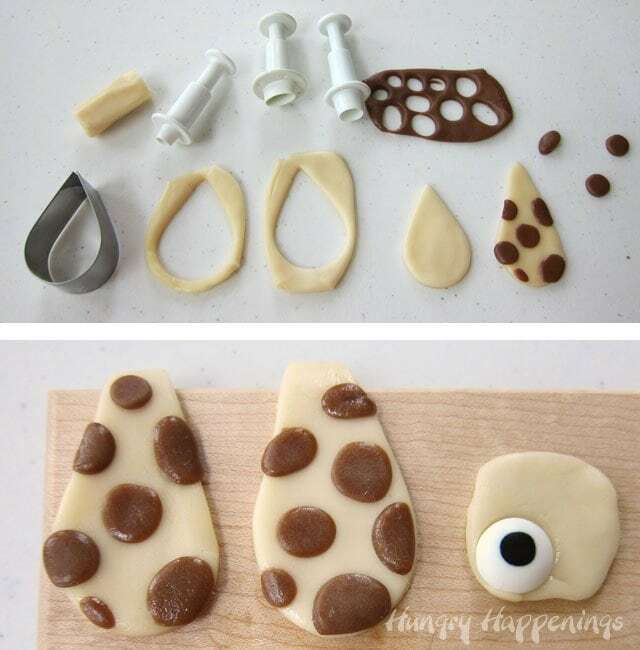 For some added fun, you can use white candy to make the ears and add chocolate candy spots. 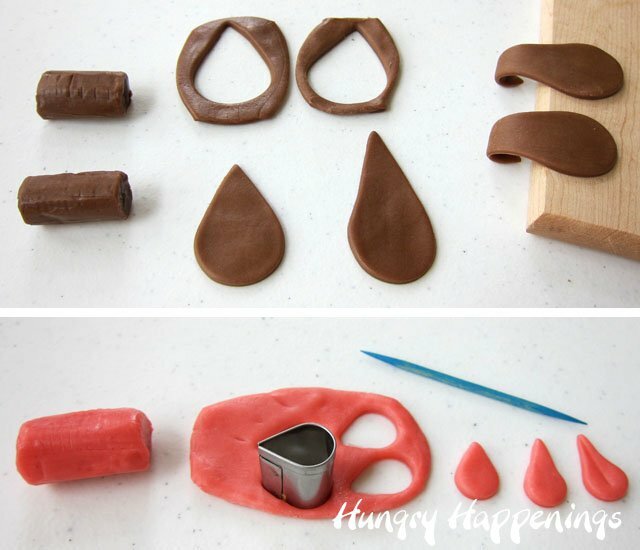 Roll out the chocolate candy rolls and cut out some small round dots using plunger cutters or metal cutters. Brush the backside of each spot with a very light coating of water, then press onto the white ear. You can also put a spot around the eye, by attaching a candy eye to a white candy spot. When the ice cream is firm enough to scoop, fill an ice cream cone with some ice cream, then add a nice rounded scoop on top. I get really nicely shaped scoops by using a large #16 ice cream scoop. Add a smaller scoop (using a #70 mini scoop) at the base of the bigger scoop. This makes the dog’s snout. Pop the ice cream cone in the freezer and make 2 more cones. 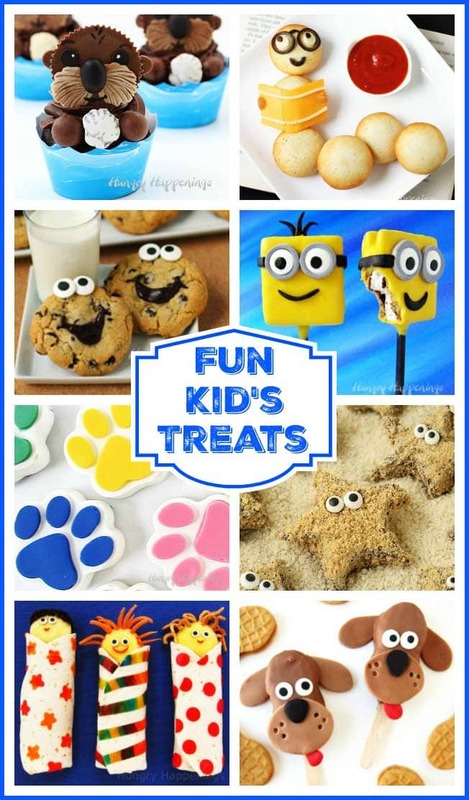 You’ll have a little ice cream left over, but I know you’re going to want to eat some while you are working, so go ahead and enjoy a little snack. After the cones chill out in the freezer for about 10 minutes, you are ready to decorate them one by one. Add a chocolate chip nose, two candy eyes, two ears and one tongue. This frosty little guy just came out of the freezer! Brr. Being this ice cream is so dreamy, I only managed to get two cones made. The rest of the ice cream disappeared too quickly. My ice cream maker is ready for my second batch, so I’m heading back into the kitchen to make some more. Have you ever made homemade ice cream using cashew milk? If not, I’m telling you this is a must try recipe. Decadently rich and wonderfully creamy cashew milk ice cream is so good, you'll never know it's dairy free. 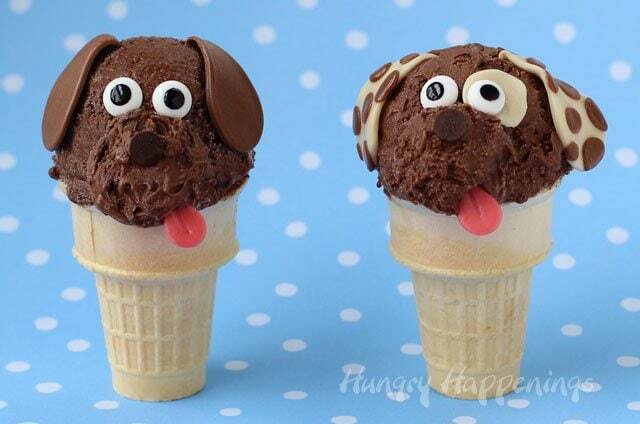 Scoop some out and decorate cones to look like adorable puppy dogs. 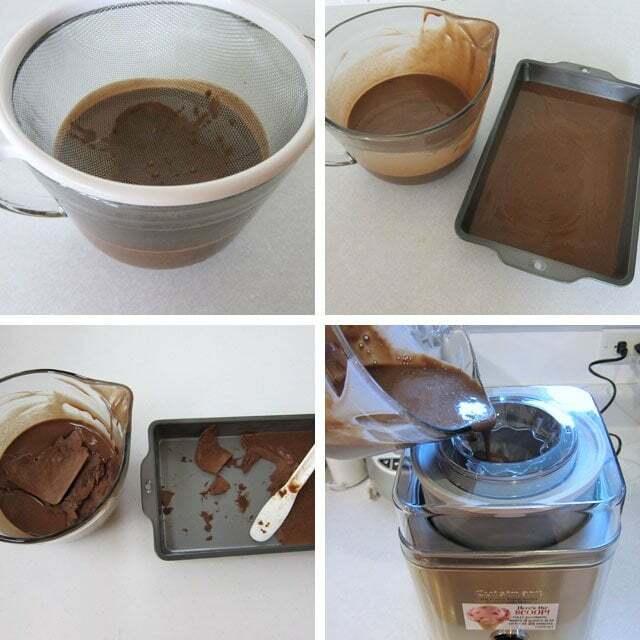 *If you need a strictly dairy free frozen treat make dark and white modeling chocolate using dairy free chocolate to use in place of the fudge and taffy rolls. 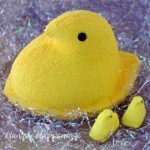 Pour egg yolks and sugar into a mixing bowl. Beat with an electric mixer on high speed until fluffy and pale yellow. Heat cashew milk in saucepan over medium heat until bubbles form. Remove from heat and stir in chocolate until melted. 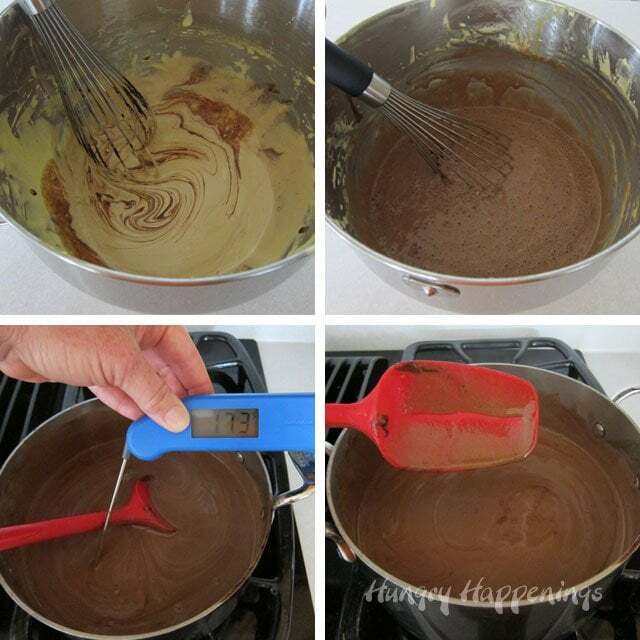 Pour 1/4 cup of chocolate into whipped eggs, stirring constantly. Continue stirring and slowly pour in remaining chocolate milk. Pour back into saucepan and return to medium heat. Stir constantly until thickened and mixture reaches 180 - 185 degrees Fahrenheit. Pour through a fine mesh sieve into a bowl. Chill until very cold, at least 3 hours, preferably overnight. Pour into prepared ice cream maker and follow manufacturers instructions to chill ice cream. Scoop into a freezer safe container and freeze until firm. 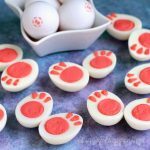 Ears - Flatten fudge rolls, cut into 1 3/4 inch tear drops. Stretch the pointed ends and bend slightly. Tongues - Flatten red taffy roll, cut into 3/4 inch tear drops, stretch the pointed ends, and indent center with a toothpick. Spotted Ears - flatted vanilla rolls, cut into 1 3/4 inch tear drops. Stretch the pointed ends and bend slightly.Flatten chocolate fudge rolls cut small dots, Attach with water to white teardrop. Fill ice cream cones with ice cream. Add one large scoop on top. Add a small scoop to the base of the large scoop. 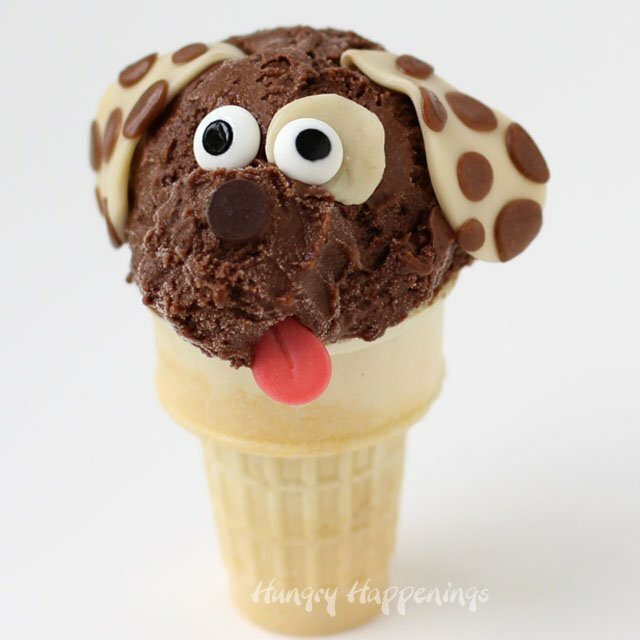 Add two candy eyes, one chocolate chip nose, two candy ears and one tongue to each cone. 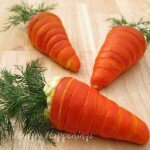 Freeze for 10 minutes, then serve. They are adorable. And….as always you showed us 2 versions of the doggy ears and eyes to get us thinking how we want to decorate our own dogs. Your photos are so wonderful, showing us exactly how to cut out the ears (and with what) and to make them elongated so they stick into the head. I know how long photos take to get just right so appreciate the effort you always put into your tutorials. 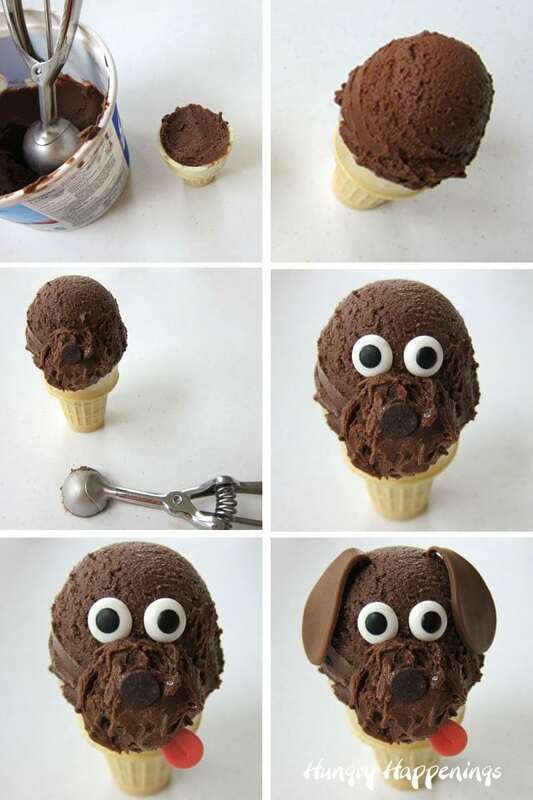 You have taken ice cream cones to a whole new level, love these little guys! The new website is looking great! Thanks, Kim. Decorating these ice cream cones has sure been more fun than redesigning the website! I’m glad you like them both. I sure wish he would, but I think he’ll just suggest we spend more time at the dog park. Oh, well, I love my dog, and I guess one at a time is enough! So cute! My daughter would love this ice-cream! Thanks, Abby. This is one of my absolute favorite ice cream recipes! It’s definitely worth a try. Thanks, Kathleen. I love working with modeling chocolate and have lots of tips and tricks listed on my Chocolate Making Page. Thanks for checking it out.